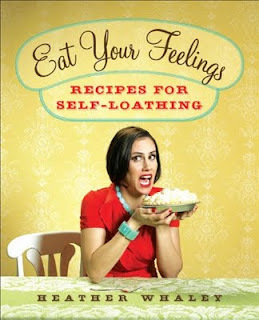 Eat Your Feelings: Recipes For Self-Loathing, seems to have it all. Recipes for self-loathing…and just in time for Valentine's Day. This hilarious cookbook offering (well, okay...spoof) by this very funny actress and playwright serves to reminds us, that unlike a bunch of fake friends and fleeting sources of reliable income, food will always be there for you. And for each of life's rainy day moments, she provides the perfect recipe to cheer you up. Whether you've just been dumped, fired, found naked pictures of yourself on the Internet, or you're over forty and living with your parents, Eat Your Feelings offers up just the right comfort food for the most uncomfortable situations. From Sky High Banana Cream Pie Because You're Dating A Married Guy, to Little Sister Earns More Than You Ham-and- Cheese Toastie, to Unwanted Pregnancy Kielbasa and Sauerkraut – this book is a total laugh out loud hoot and a must-have for all of life's little unexpected curves. How perfect for those of us who are emotional eaters!